AFTER opening the bright and lacquered red door at La Vucciria I must admit I was a little bit taken a back with the decor of this Sicilian trattoria – I thought it a bit too dark for my ageing eyes. Tea lights and a couple of slated wooden (but beautiful) ceiling lights try to illuminate its black walls and dark wooden floors where dark blackwood chairs and tables stand. To one side is a grey marble bar lined with wooden stools with the rear wall stocked with what seems to be every liquor required. Large black-and-white photographs of Palermo’s famous La Vucciria market (which the restaurant is named and inspired by), adorn the opposite wall. At the far end is a floor-to-ceiling blackboard proudly declaring the menu. Sicilian themes are also loudly proclaimed with a giant and proud cactus and a bust of the sun god Apollo both at the entrance. For a modern (and cheeky) touch there’s a graphic of a handgun hanging on a wall. La Vucciria is on busy Flinders Street at Paddington (just down from the Captain Cook Hotel and the SCG). I remember it many years ago as a Thai restaurant – Wild Rice – a nice little place where I dined a couple of times and on my last visit where I was hypnotized as part of the entertainment for a mate’s 40th birthday. I don’t remember much but apparently I crowed liked a rooster and gave birth to a teddy bear. I digress (as my mind did that embarrassing night). La Vucciria’s service is friendly, unobtrusive and generous. As soon as we are settled the wine menu comes out with a little bowl of plump green Sicilian olives. The menu on the back wall is hard to read in the dimly lit and dark space but thanks to the attentive and knowledgeable waiter it is dictated with flair (and translated), to the group of ex-pat South Australians I was dining with. Our waiter, after reeling off the menu, declares that the restaurant and its chef, Fabio Alacqua (a Sicilian native), will use the freshest seasonal produce he can find to recreate classic Sicilian-inspired dishes. He also announces proudly that Fabio makes his own pasta for that genuine Sicilian touch. The wine list features a blend of Australian, Sicilian and other Italian regional wines and is pasted on some sort of old Sicilian travel magazine or brochure which is as interesting as the list (and a little distracting). Eventually we all decide to go for a Sicilian: a Torre Solaria ($42) and another Italian: an Abruzzo Masciarelli Trebbiano ($42). As the wine is poured a large white plate of gleaming pink thin slices of prosciutto twirled on cristini sticks and drizzled with olive oil are delivered gratias from the kitchen (and was well received by the table). La Vucciria’s (and Fabio’s) generosity was to continue throughout the night. The menu is about simple Sicilian-inspired fare, and as we were informed, could change daily as it was dependant on what Fabio found in at the markets. On this night the entrée were: prawn arincini ($15); eggplant involtini ($13); crispy calamari, prawn and zucchini ($18); prosciutto and figs ($18); crispy polenta with gorgonzola ($10); tuna meatballs with a red sauce ($15) and veal scotata with rocket and parmesan ($15). As for the mains there was maltagliata pasta with prawns and pistachio pesto ($24); rigatoni alla norma ($19); spaghetti pesto acilaoano ($19); veal braciole ($20); veal cotoletta pravarera ($23); and salmon lemon butter cream ($24). I must admit I was surprised by the prices on the menu – they seemed too good to be true – and I was sceptical as to what would come out. I was also a bit confused seeing three pasta dishes as secondi (traditionally a first course dish). We decided to start by sharing two plates of the crispy calamari, prawn and zucchini ($18), and a plate of the prosciutto and figs ($18). The seafood came out on a white plate and sat atop brown paper with two large wedges of lemon. 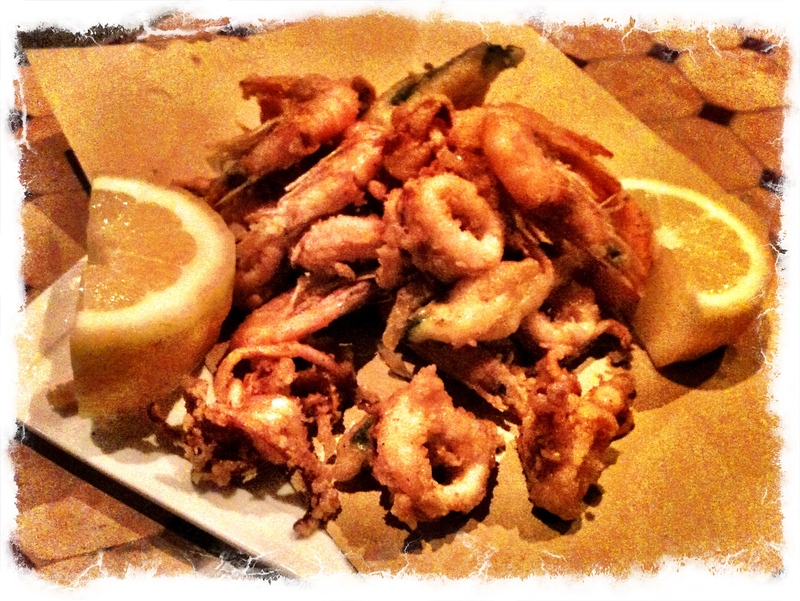 It was a pile of golden and perfectly fried mix of school prawns, calamari and baby julienned zucchini. The calamari was delicate and soft and the prawns were small and crispy enough to eat head and all – perfectly cooked to retain their juices and sweetness. The addition of baby zucchini was appreciated as the vegetable’s slight acidity and moisture helped to refresh the palate from being to overly dominate the fried seafood. There is always something delectable about the combination of figs and prosciutto and figs are something I always order in an Italian restaurant when they are in season. You see, Italians respect them and treat them well (probably better than their spouses). Fabio must love his figs – the ones he chose were perfect – not a blemish on them. 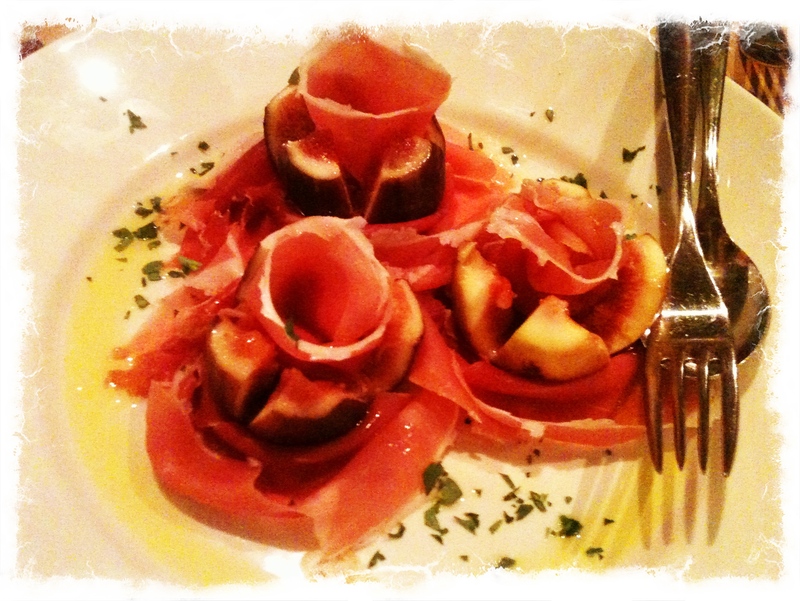 The prosciutto and figs were three whole fresh and juicy figs which had been almost quartered and topped with large, thin slices of that wonderful cured pig that we had as an appetiser but twirled and arranged in such a way to resemble a pink water-lily. The dish was also a perfect accompaniment to the Abruzzo Masciarelli Trebbiano we were enjoying at the time. I wished I didn’t have to share them. 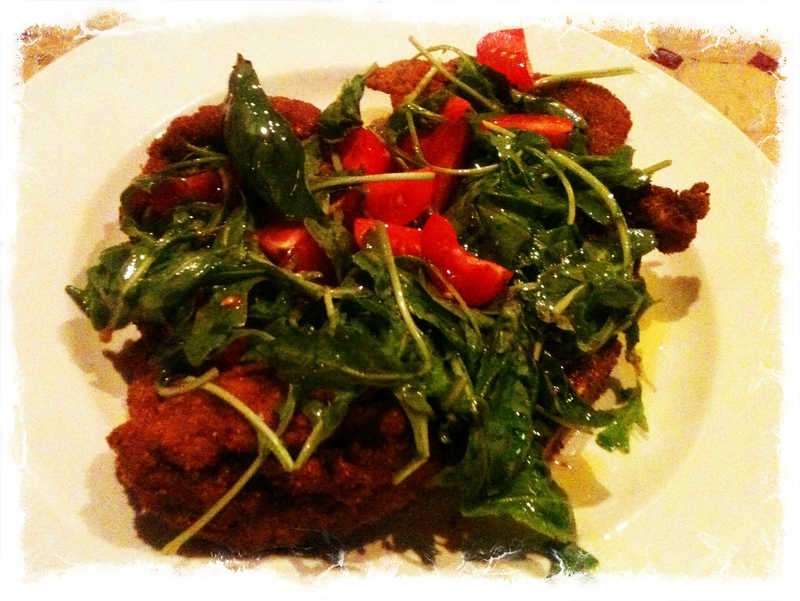 For main I had the veal cotoletta primavera ($23) a huge piece of veal on the bone that had been lightly crumbed and fried and dressed with ripe baby tomatoes and rocket tossed in virgin olive oil. Cotoletta is to what schnitzel is to Italy’s alpine neighbours the difference being that the Italians keep the bone on the cutlet, it is bigger and fatter, and the cut is usually from a better part of the animal. The cutlet seemed grilled rather than fried (sticking to Sicilian practice), the crumbs golden and light with the wonderful fresh mixture of greens and ripe tomatoes enhancing this simple, yet filling and traditional, dish. My mate opposite me ordered veal braciole ($20) which was skewered cut veal dusted in a parmesan crust. The remaining four diners had maltagliata prawn ($24) – a pasta dish. We could have ordered a typical Italian salad to accompany the mains such as an orange, fennel and rocket ($8). 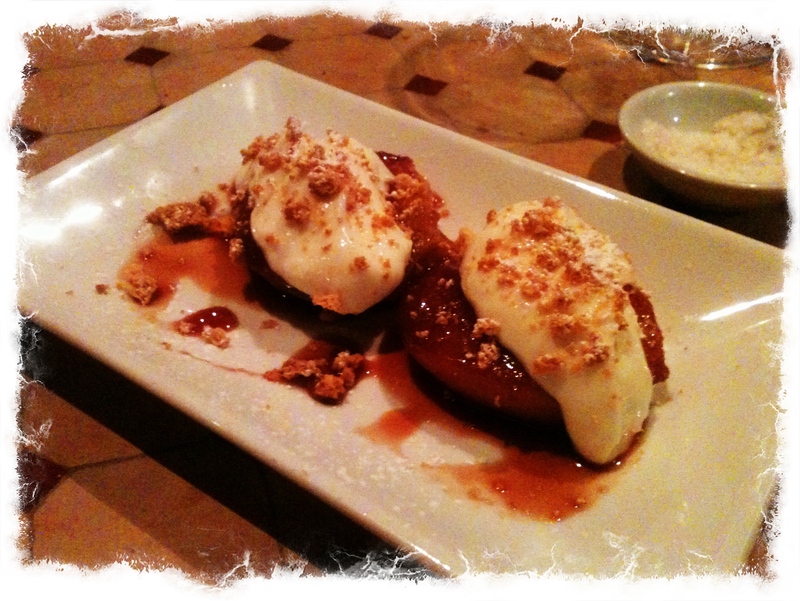 Unexpectedly our waiter brought out two of La Vucciria’s deserts to share courtesy of Fabio – grilled peaches topped with a ricotta cream and a slice of rich chocolate almond cake (both $9). We must have been a very behaved group (or this was a continuation of La Vucciria’s excellent hospitality that we had been enjoying). The bill arrived with an assortment of lollies for a huge bowl on the bar – a fitting end to such a sweet night. Apparently La Vucciria has an ‘Aperitivo’ session where small plates of food accompany cocktails, wine and beer (including ‘na Biretta, an Italian beer from a brewery in Fiumicino near Rome), between 5pm and 7pm. The verdict: The décor may be hard for my eyes but as for the food my palate will never tire. Generosity, an interesting décor, top-notch service and well-priced and simple tasty Sicilian dishes make La Vucciria one of those trattoria’s that you wished that you had around the corner from your place. 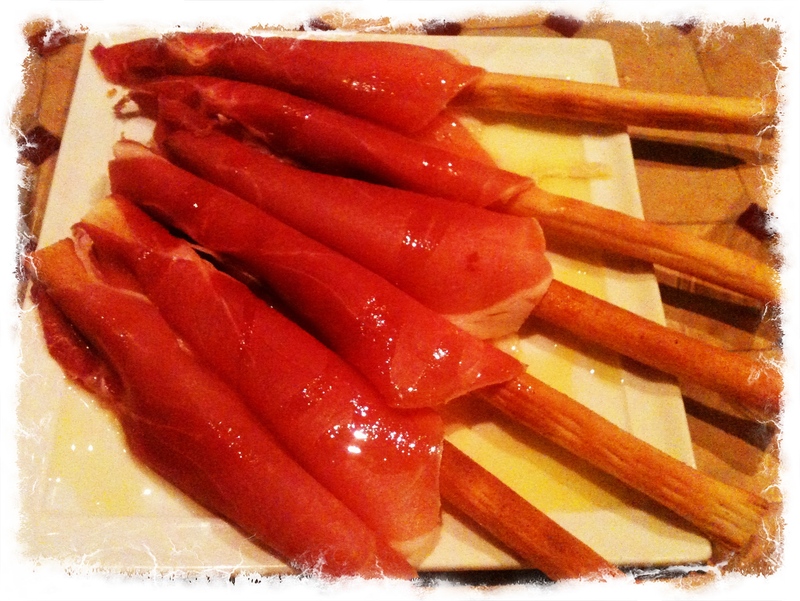 What: La Vucciria, 160 Flinders Street, Paddington NSW Australia. Open for dinner only from Tuesday to Sunday. Phone (02) 8068 – 5598. Ate there: 3 February 2012. For a nice article on Palermo’s La Vucciria market go to this piece by the New York Times. 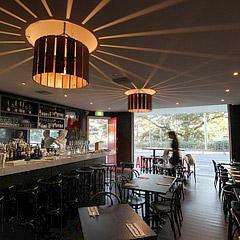 This entry was posted in Italian, New South Wales, Sydney and tagged Australia, Food, Italian, La Vucciria, Sydney. Bookmark the permalink.